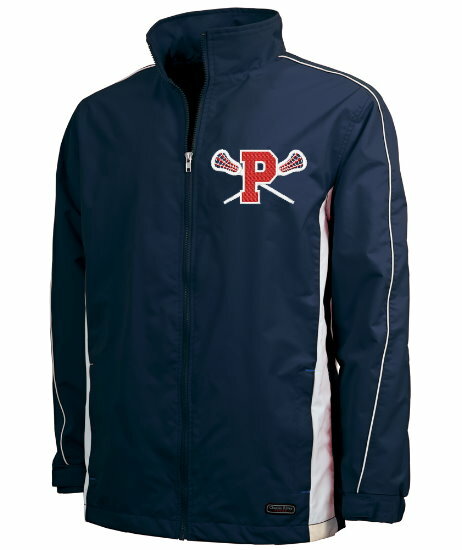 This is one of our favorite jackets. Durable, wind & water-resistant Dobby Nylon. Mesh-lined body for breathability and taffeta nylon-lined sleeves for easy on/off. White piping on sleeves and white panel insets at sides (on front & back). Stand-up collar and elasticized cuffs with hook & loop closure. Zippered pockets. Vented back for breathability and for full back decorating access. Open dropped tail hem with adjustable shockcord drawstring provides extra coverage. Available in youth and adult sizes. Lacrosse logo embroidered on front left chest and Titans Lacrosse printed on the back in red and white. Sample jackets are available for sizing at the workshop.